My shop carries two lines of milk paint which means you have over 60 colours to choose from! If you love Miss Mustard Seed's Milk Paint, you will also love Homestead House Milk Paint. Both lines of paint are made in Canada by Homestead House Paint Company. Milk paint can also be mixed to create your own custom colours. This fresh color captures the feel of a classic farmhouse with white-painted wood siding, nestled in a bucolic valley. Farmhouse White really is a "perfect white". Not too cool, not too warm and covers better than the other whites in our line. Linen is the cream in our line. Named for linen fabrics that have slightly yellowed with age, this colour has warm undertones and is a nice, creamy white. Mix Linen with colours to make the colour lighter and warmer. Linen mixes and pairs beautifully with Kitchen Scale. Ironstone is the closest to a pure white currently in the line. It is named after Miss Mustard Seed’s favourite thing to collect, white ironstone china. This colour is a slightly cooler off-white and pulls a little gray. If you want white, this is your colour. Obviously, white pairs well with everything! Grain Sack is one of Miss Mustard Seed’s favourite colours, named for the colour of antique European grain sacks. It’s a chameleon colour, meaning it looks different depending on what is around it. Sometimes it looks white, sometimes gray and sometimes more beige. Grain Sack is a great colour to mix in order to lighten without making the colour too pastel. It pairs well with the other grays in the line – Shutter Gray and Trophy. Typewriter is the black in our line. Miss Mustard Seed describes it as an off-black or soft black. It is named for the black colour traditionally found on antique typewriters. Mix Typewriter with any of the colours in the line to make them darker and more muted. For example, when mixed with Boxwood, a deep olive green can be achieved. Mix it with Grain Sack to make a perfect charcoal gray. Trophy is a warm, rich gray with yellow undertones. Unlike Shutter Gray, which is very blue, Trophy is a truer gray reminiscent of tarnished silver found on antique trophies. Miss Mustard Seeds loves to layer Trophy under Grain Sack and Ironstone for a faded, Swedish finish. Curio is a rich, walnut brown that is perfect to use as a glaze or stain. It’s also a great colour to use for mixing with other colours. It was named for the rich wood on a curio Miss Mustard Seed inherited from her aunt. Named for the delicious almond paste famous in Germany, Marzipan is an equally delicious warm neutral. It’s an off-white with beige and warm gray undertones. It pairs beautifully with Ironstone for a subtle contrast. This rich, stone color is named Schloss, the German word for castle. It’s warmer and richer than trophy, making it the “greige” that our customers have been asking for! Mora is named for the famous curvy clocks made in Mora, Sweden. It is a whisper of a color – a neutral with gray, blue and green undertones. Miss Mustard Seed loves Flow Blue layered under French Enamel for a two-toned finish. It also pairs well with Boxwood. Artissimo is our navy/midnight blue named for the blue and white fabric Miss Mustard Seed used in her master suite. Depending on the finish, it can look like a brighter royal blue or almost black. Artissimo pairs well with Boxwood and the other blues in our line. As a lover of blue, Miss Mustard Seed couldn't resist adding this new hue to the line. Aviary, a smokey blue gray, was inspired by and named after an antique birdcage Miss Mustard Seed purchased a few years ago. French Enamel is named for the French enamelware pitchers Miss Mustard Seed has always admired in antique stores and magazines. The colour is a vibrant, mid-tone blue. Mix it with Tricycle for a vibrant purple or Typewriter for a darker, more muted blue. It pairs well with Flow Blue and Mustard Seed Yellow. Shutter Gray is another one of Miss Mustard Seed’s favourites. It’s a French blue/gray that has a faded quality about it. 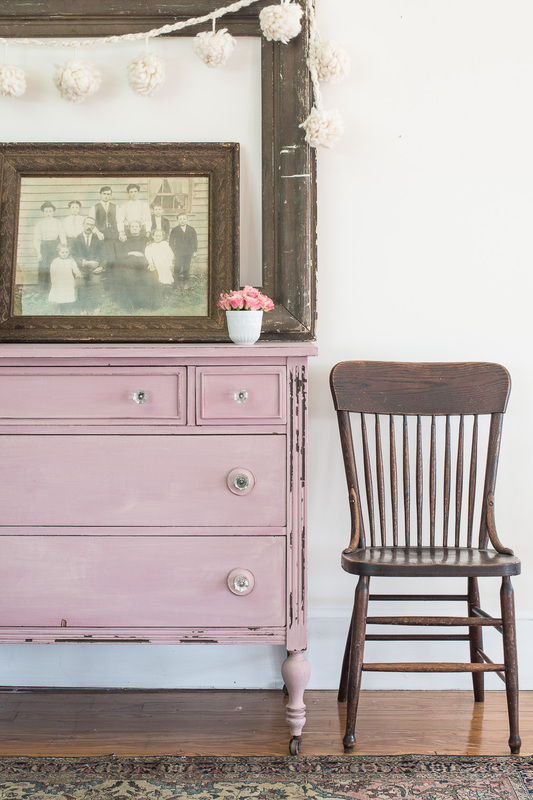 It’s named for a pair of antique gray shutters Miss Mustard Seed found at an antique store. Eulalie’s Sky is a pale greenish-blue named after the colour in the sky of a cow painting by artist Cindy Austin. Miss Mustard Seed named the cow Eulalie and she has hung happily in her home for several years and has become a trademark of Miss Mustard Seed’s style. Boxwood is our rich, dark grassy green. Depending on the finish used on the piece, it can look bright and bold or subtle – more like a muted olive. Boxwood is named for the preserved boxwood wreaths and topiaries Miss Mustard Seed uses in her interiors. Lucketts Green is named after the colour of the shingled siding on The Old Lucketts Store in Lucketts, Virginia. It is Miss Mustard Seed’s favourite antique store and source of design inspiration, and she was a vendor there for several years. Lucketts Green is a soft, spring green with yellow undertones. It’s very close to the colour commonly found on furniture in the 1930’s and 1940’s, making it the perfect vintage green. Mix with Boxwood to make a bright, grassy green or with Linen for a pale pastel. For a nice contrast, Lucketts Green pairs well with Artissimo. Kitchen Scale is a rich teal, named after an antique scale Miss Mustard Seed once owned in her kitchen. The scale has since been passed along to Jennylyn, the president of Homestead House Paint Co. Kitchen Scale can be mixed with Linen to achieve a soft, robin’s egg blue. It pairs well with Grain Sack. Tricycle is the perfect red. It’s bold and bright, but still has a warm, classic look to it. When Miss Mustard Seed was naming the red in her line, Tricycle immediately came to mind. Mix it with Ironstone or Farmhouse White to get varying shades of pink and with Curio to make a deeper barn red. Outback Petticoat, is rich, earthy and full of fire — like the Outback settlers and pioneers. It’s a gorgeous shade that is warm, classic and bold. I love the imagery the name evokes and the reference to the stained hems of petticoats worn by women in the 1800’s and early 1900’s.